The curatorial files at the British Museum says of this print series: "Each of the fifty-four chapters of The Tale of Genji is named and is associated with a crest called a 'Genji-mon'. 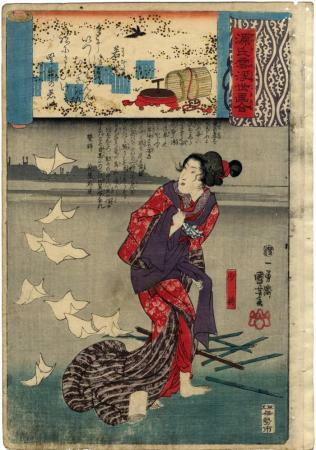 In this series, each of the first fifty-four prints portray various scenes from history, legend, and literature that are suggested by a specific chapter of the novel and the appropriate Genji-mon is shown in the upper left cartouche with a poem. This series consists of one design for each of the fifty-four chapters and six supplementary designs." There are two prints from this series in the Lyon Collection. See also #979.